What Might a Culture of Writing Look Like? Writing Across the Curriculum often purports to promote and develop a "culture of writing" on a campus. I've never really been sure what that sort of culture would look like on the ground. More students writing in more classes? The number of courses with some designation as writing intensive? Widespread faculty involvement in writing instruction in courses throughout an institution? Healthy submissions to on-campus student publication venues? Something else, or a combination of evidence? I've always been somewhat uncertain about what I'd accept as signs that a campus has developed such a culture. At least until recently. In 2008 I advocated for my school to participate in the 2009 National Survey of Student Engagement (NSSE) and the 27 supplemental writing questions developed with the Consortium for the Study of Writing in College. My aim was to get some comparative perspective on what our students do with writing in classes. Accustomed to seeing data showing that York is "not yet" on par with her sister institutions, I was not confident we'd find signs of a writing culture on campus. This despite a robust set of writing requirements for graduation, a decade of WAC, several student publication venues on campus, and more. Call it skepticism, I suppose. In the words of Richard Dawson from Family Feud, "Survey Shows"
These are impressive mean score differences in some of the most important elements of the writing process, with most of them highly significant and all of them pointing in the desirable direction. On a potentially less upbeat note, York students seem to proofread their work at the same rate as freshmen across the country. (But I'll take that finding any day of the week, and twice on Sunday!) The day I saw these data I started saying that York has a culture of writing. When I looked at another set of responses, those having to do with good writing instructional practices, I really had no choice but to "feel" like the faculty teaching freshmen also participate in this culture of writing! These mean scores are less dramatically different from the national mean than are the first set of scores. 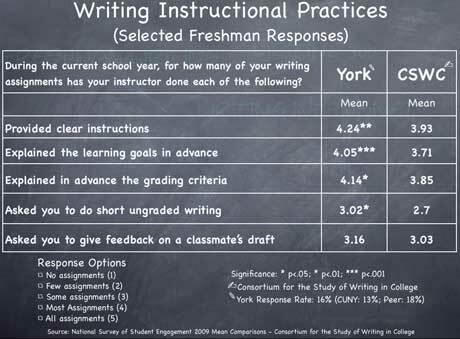 But there is no denying that York freshmen report that their instructors employ best practice writing instructional techniques that meet or exceed the use of such practices nationally. The strength and directionality of these mean score differences blew me away, and I'm paid to be a cheerleader for writing and for writing instruction. Live and learn. I'll be sharing these data with a group of campus leaders early next year. I hope they're as encouraged and impressed as I am. Faculty on campus are doing great things!